The days are counting down to the release of “From the Stories of Old,” a new anthology of fresh fairytale retellings, introducing the world to the talents of a group of budding new authors on 7th December. One of those authors, Corinne Morier, has kindly stopped by to tell us about the project. Corinne: I’m a huge geek and I’m really into anime and video games, along with my writing. I studied Japanese language in my undergrad and wound up minoring in East Asian Studies. During my undergrad, I traveled to Fukushima for two weeks as a part of the Facing Fukushima project. With two of my professors and five of my classmates, along with a KALW radio producer, we interviewed survivors of the Great East Japan Earthquake. The earthquake struck the prefectures of Fukushima, Iwate, and Miyagi on March 11, 2011, triggering a tsunami and a nuclear meltdown at the Fukushima Daiichi Nuclear Power Plant. We produced a website displaying the stories of the people we’d met and the challenges they face. After college, I moved to Japan with the JET program to teach English, and now I live in Iwaki in Fukushima prefecture, teaching English at six elementary schools in Iwaki city. And when I say six, I really do mean six–I go to a different school every day of the week! When I’m not writing, I like watching anime, playing video games, swimming, and playing chess. I want to be a novelist someday, although I also enjoy teaching and am thinking about going for my teaching certification once I finish my tenure in Japan. Corinne: I teamed up with twelve other writer friends of mine to release an anthology of fairy tale retellings. We each chose a different fairy tale or myth and put our own spin on it, which I’m really excited about. When I was in college, I took a class where we studied fairy tales, and one of our final assignments for the semester was to adapt a fairy tale and make it our own. I had fun doing that, which is why I’m so excited about this anthology. Back in college, I wanted to rewrite The Little Mermaid for the assignment, but we hadn’t read that one in class and my professor wouldn’t accept it. I chose Sleeping Beauty instead, reserving my Little Mermaid idea for a novel-length adaptation. I wound up writing Sleeping Beauty set in Edo-period Japan (late eighteenth century). Elise: Which fairytale did you choose for this anthology? And what inspired your retelling? Corinne: I chose to adapt The Goose Girl, which has always been one of my favorite fairy tales. When I was a child, my grandmother gave me a book of fairy tales, and I was really fascinated by The Goose Girl because of the colorful illustrations that accompanied it. I still have that fairy tale book! My retelling is set in an urban, modern-day setting–Avelyn Stevenson is traveling to Los Angeles to meet Marco Conti, a young man with whom she has been exchanging e-mails. Instead of a princess, Avelyn is merely a rich girl, and the horse in the original tale, named Falada, has become a human boy named Felix in my adaptation. Elise: It sounds great! So,what else are you up to in your writing life? Corinne: Aside from this project, I have five novels in the works, and I rotate among them when I get bored. I have the first book in what I hope will be a high fantasy trilogy, which is a finished first draft that I now need to edit and polish up. I also have Book Two in the trilogy, which is almost finished but needs a bit of work. 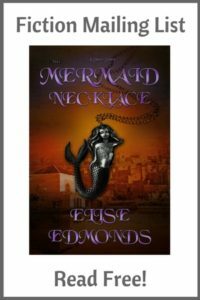 I’ve also got my Little Mermaid novel-length adaptation, which is not yet a finished first draft but is very close–about 85% finished. I’ve got another high fantasy novel about a princess from a lost kingdom–that one is the farthest from finished out of all of them. I still have over half of that one to write. And then I have another novel, which is currently in the editing phase, about a girl who goes to Japan to study abroad. It’s not fantasy, but it is young adult, and I hope that my readers have as much fun reading it as I did writing it. Elise: It sounds like your work and visits to Japan inspire your writing, then? Corinne: Yes, of course. After my visit to Fukushima two years ago, I felt very inspired. My classmates and my professors didn’t speak Japanese, but my professors were both Journalism instructors, and my classmates were all Journalism majors. They had all been trained in news reporting, especially as it concerned survivors of a natural disaster. I knew how to speak Japanese, but I wanted to produce something of equal caliber to my friends’ stories, so I decided to put a spin on it using my background in creative writing. I decided to write a novel based on our trip, about a girl who goes to Japan to study abroad. She develops an interest in the Great East Japan Earthquake, especially when she discovers that her host family also carries scars from the disaster–her host brother’s birthday is on March 11, and he was late picking up his little sister, and as a result, she died in the earthquake, so her host parents and host brother all have their own baggage from that day. I wrote the first draft before I even knew I was going to be able to live here in Japan, but since arriving, I have used my own experiences (such as culture shock and homesickness) to add more of an authentic feel to the story. If anyone is interested in learning more about the Great East Japan Earthquake or our project, please feel free to visit our website. Elise: How long have you been a writer? Corinne: Been a writer? Ever since I could talk. I remember being maybe six or seven and making up little stories as I went about my day, like when I went to my swimming class, why the light was refracted in the pool a certain way, or stories starring the toy cars I had at the time. When I was in the first grade, I wrote a story about me and my friends going in a rocket ship and flying to the moon. But if we’re talking more of “Known that I wanted to pursue it as a career,” that would be about halfway through my freshman year of high school, right after I participated in the school production of Hamlet. A few days after we wrapped, I was suffering from the depression that always follows a huge event with a ton of buildup, so I wrote my own version of Hamlet. And I had such fun doing that and creating my own story that I decided I wanted to write for a living, although for a few years after that, I wanted to be a movie director rather than a novelist. My decision to be a novelist came later, during my senior year of high school. Elise: What’s your favourite book and why? Corinne: Oh, hands down, The Lord of the Rings. I read it once every single year without fail, and I always laugh at the funny parts and cry at the sad parts. I’m the kind of person who loves reading the same books over and over again, but after a while, reading the same book can get kind of repetitive, because after so many repeated readings, there’s just nothing new to discover in the story. Yet I’ve read LOTR every year for the past four years in a row, and I always discover something about the story which I hadn’t noticed before. Elise: And have you read any indie (self-pub) books recently that my readers might like to read? Corinne: Oh, yes. I would really recommend Eve: The Awakening by Jenna Moreci. Eve is a chimera, a more evolved form of human with psychic powers. All she wants is to start over with a blank slate at Billington University, the most prestigious university in California, but when chimeras are being hunted to extinction by aliens for unknown reasons, she’ll have to fight to rescue her friends and herself. It’s a gripping, thrilling NA science-fiction read that grabs you from page one and doesn’t let you go again until you’ve reached “The End.” Because of mature content, I would not recommend it to anyone under the age of sixteen, but I couldn’t put it down and it’s definitely a must-read. Also The Heart of the Winterland by Kristen Kooistra, which is a kid-friendly novel with a fairy-tale feel. Cali is the princess of Trabor, a snowbound kingdom with her as its lone inhabitant. Her only companion is Voice, a magical guardian enchanted to look after her every need. On her 200th birthday, she sets out on an adventure to discover the land beyond her own kingdom and why she is all alone in a world of snow. For your younger readers, Heart of the Winterland is a book worth reading, and for your older readers who don’t mind a bit of bloodshed and swearing, Eve: The Awakening is a gripping adventure. Elise: Great! I’ve read Winterland and agree with you. I will have to check out Eve some time. And now for a quick-fire round to finish off. What’s your favourite…..
Melon bread–a Japanese snack that is not at all what it seems. Containing no melon whatsoever, it’s only called melon bread because it looks like a melon. It’s essentially sweet bread enveloped in cookie dough, dipped in sugar ,and baked until golden-brown. Can I choose multiple shows? It’s a tie between Game of Thrones, American Dad, and Law and Order: Special Victims Unit. As a teacher? English, because that’s my subject. As a student? Music! Currently it’s a tie between Mr. Almost by Meghan Trainor and Gold by Victoria Justice. Mulan. Was there ever anything else? I’m just frustrated that my students don’t know Mulan, so I’ve made it my mission to teach them who Mulan is. Breakout-free sunscreen. I have really sensitive skin, so it’s great to have a sunscreen that doesn’t clog my pores and make me flare up. Anime. There are lots of different kinds of anime out there, but unlike other types of media, where if you don’t like Game of Thrones you’re a blasphemer (I’m guilty of calling others blasphemers for not liking GoT) or if you don’t watch Dr. Who you’re a noob (I have been called a noob for not liking Dr. Who), no matter what anime you do or don’t like, you’re welcomed with open arms at any convention you go to or in any anime club you join. It’s a great way to connect with others and make friends across cultural, socio-economic, political, and age boundaries. Sea otter. They’re just so cute! Corinne Morier is a fantasy author with a penchant for writing stories that make readers feel. When she’s not writing her own stories or pestering her writer friends to hurry up and finish their books, you can usually find her playing video games, watching anime, or swimming. 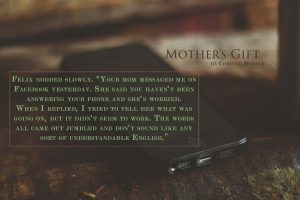 Her paranormal flash story The Photo was published by Roane Publishing, and her short story Mother’s Gift is available in the Just-Us League Anthology. She chose to adapt this fairy tale because it has been one of her favorite fairy tales ever since she was a child. 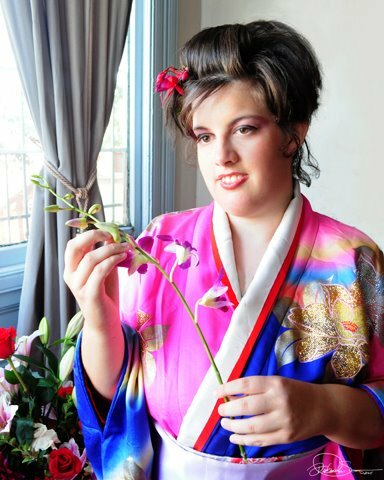 Catch up with Corinne on her writing blog, Japan-related blog, Facing Fukushima website, Twitter, Facebook, Otaku Madness YouTube (anime/gaming), and her ALTKaren YouTube (Japan-related). And don’t forget, everyone, the anthology’s out 7th December! “From the Stories of Old.” You can find it on KDP Select. I also second Heart of the Winterland–it is an amazing book. So does that mean Felix is killed and his head nailed to the wall? I’m on lack of sleep and low health, so anything I do or say during this time cannot be held against me. 😀 But Falada in the original totally is killed and has his/her head cut off and nailed to the wall surrounding the city where it then talks to the princess every day when she goes out to tend the geese. Or maybe she just talks to it, but either way . . . I want to know if Felix has that happen to him. Ah-ha! So that’s why Amazon had my book labeled as a children’s book. 😛 I’m now blaming Corinne for the nightmare of sorting that out! I had no idea that LOTR was your favorite book. I’m in shock right now, like I’ve had to completely reevaluate everything I thought I knew about Corinne. ‘The Goose Girl’ is one of my favorite fairy tales too. There aren’t many retellings of it. So I’m looking forward to reading your story in the JL Anthology!